With JungleDocs you can easily merge multiple PowerPoint files into one. The process is very similar to Word document merging using Small Parts with JungleDocs. In this tutorial, you will learn how to do this. 1. First, create a library for your PowerPoint Small Parts. 2. Now create folders in this library and copy the slides into the folders according to the topic . We recommend creating one PowerPoint slide per file. 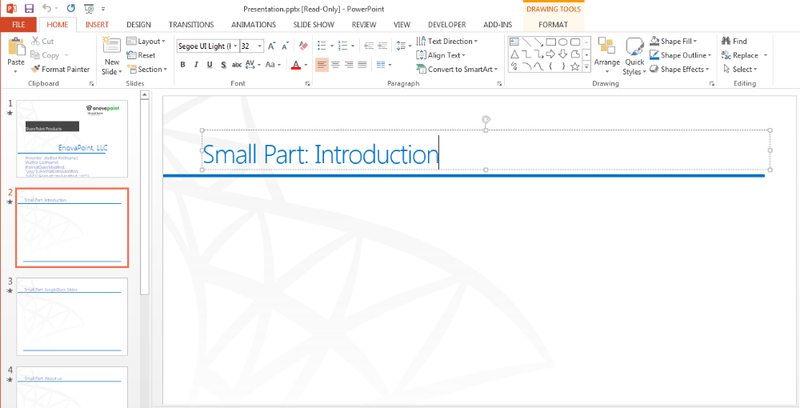 Now that you have created a PowerPoint Small Parts library it is time to move on to your PowerPoint template. 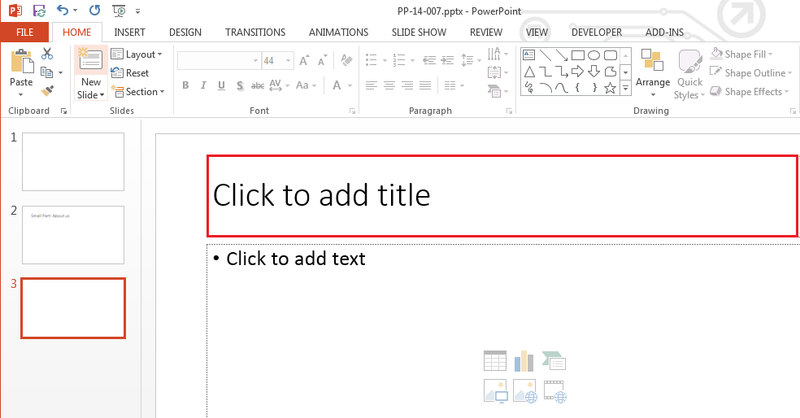 Modify the main PowerPoint document template to point to the Small Parts folders. To do this, enter Small Part: FolderName into the slide you are creating and reference to a particular Small Part slides folder. Note: unlike in Word, there are no content controls in PowerPoint. So you simply write the text in a slide. Use one slide per one Small Part Folder. 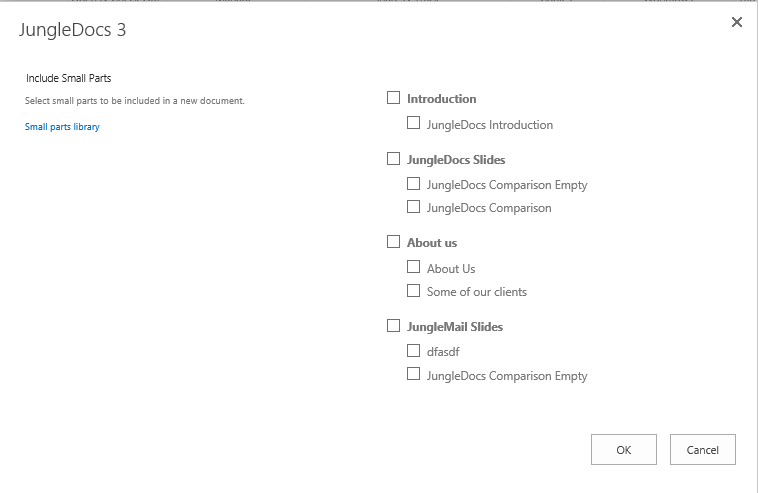 Now that you have configured your PowerPoint template you can move onto working on the JungleDocs rule. 1. 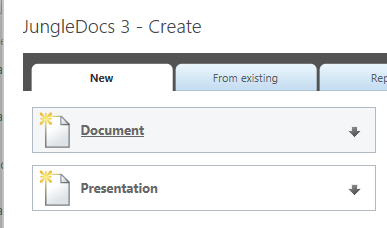 Create a library for storage of the generated presentations, add the Content type with the configured template and required columns. 2. In this library, launch JungleDocs from the ribbon. In the New tab you will automatically see all rules based on the library content types. 3. Click on the arrow down to edit the base rule. In this example it is "Presentation". 5. Edit other rule settings if needed. Once the Small Parts library is defined the JungleDocs rule icon will say so. 6. You can also decide to create a new base rule with different settings for another template. Note: in the Content type template you can have one slide pointing to one Small Part folder in your Small Parts library. You will be able to include tens of documents from that folder by clicking the checkboxes. You can insert 5 slides or 25, simply by using the same setup and templates.